€3.00 nominal fee or free for Oberstdorf visitors with an Allgäu Walser Premium Card! as the impressive Hochvogel and Trettachspitze. The Nebelhorn is the ideal starting point for slightly more demanding routes such as the Hindelanger Klettersteig (via ferrata) or the spectacular hike over the Laufbacher Eck. Here, you are already in high Alpine terrain and so some experience is necessary. No matter which route you choose, you’re sure to enjoy many unforgettable moments! Anyone who wants to take things a bit easier can find the perfect midaltitude hike or take a stroll through the traffic-free side valleys. Spanning over 200 kilometres, the hiking network offers a route for everyone. Of course, you don’t have to head out on your own. If you prefer hiking with others, the extensive hiking programme offered by the Tourist Information Office is the perfect solution. You can naturally also find us on social networks. Join the Oberstdorf community. For some online inspiration, visit the Tourismus Oberstdorf website with its extensive information and helpful host search function. Conveniently transfer holiday information straight from the hiking brochure to the Oberstdorf app on your smartphone. How it works: Download the Oberstdorf app free of charge from the App Store or Google Play Store, tap the ZOOM icon in the app and scan the selected barcode in the brochure. The app takes you straight to the desired topic and allows you to save the content in the app for your next Oberstdorf holiday by tapping the heart icon. A characterful village with a sense of community. Friendly, sports-mad, cosmopolitan and traditional. It’s not just nature that’s truly impressive here. Breathe in the fresh mountain air and discover the spectacular natural landscape of the Allgäu Alps, with over 200 km of scenic trails and route options at three different altitude levels. Enjoy your holiday in Oberstdorf at the southernmost tip of Germany. Live webcams provide clear images of the Oberstdorf mountains and valleys at: www.oberstdorf.de / webcams. When preparing for your holiday and for extensive use on arrival, the following hiking maps offer clear guidance for your hikes. Dien ar h t be g e h b nter nic Wi Buchwald Moos-A. F urther information about disabled-friendly holidays can be found from page 76. The addresses for the Tourist Information Offices can be found on page 86. The hiking maps shown naturally only cover a small number of the region’s many hiking options. Further hiking guides can be found in the local bookshops. Both hiking maps are available from the Tourist Information Offices in Oberstdorf and its districts. KrautersA. Vordere Tra Traufberg-A. uf b Hintere Traufberg-A. Sc zenhüt- Aurikels str. tr. kenst Wes r. tstr i . Objective and local – first-hand Alpine information The Alpine information available for Oberstdorf is unlike any other you will find for anywhere else in the Alps, with everything you need to know about the entire hiking region on a single website. Hiking is BOOMING! In view of this trend, it became clear to Tourismus Oberstdorf that dealing with the huge number of enquiries made in Oberstdorf would be an impossible task for one person alone. As a result, Moritz Zobel, Head of Alpine Information, created an extensive website. This site is packed with so much detailed information that there are few questions left to ask. Signs You’re on the right track in Oberstdorf! All hiking trails are signposted as clearly as possible to guide you on your way. Please note that the signs show times rather than distances. Yellow: trail runs along the valley (flat) and can be completed in basic footwear and sometimes even with a pushchair. Red: trail requires sturdy footwear (good soles) and sure-footedness. Blue: Good footwear, sure-footedness and a head for heights are required. Out and about with Nordi Experiences for children and the whole family Join me, Nordi the little squirrel, for some great adventures. There’s always something going on in Oberstdorf – whether it’s summer or winter, peak holiday season or the quieter months of the year. Let me take you on a tour and I’ll show you my Oberstdorf and the many things it has to offer. The activity book for explorers, adventurers and genuine Oberstdorf connoisseurs. Come together to have fun, be creative and experience Oberstdorf – a varied programme for children and families. My exciting programme offers something for everyone – from hay-based handicrafts, pottery and pizza making to action-packed rides on the Allgäu Coaster or a couple of fantastic hours at the ice sports centre. You can also join me on several excursions. Together we’ll marvel at the home of the ski jumpers, the Audi Arena, and look over the shoulder of the cheesemaker to see if he’s making enough holes in the Allgäu cheese. As a squirrel, my knowledge of Oberstdorf’s natural beauty is second to none. Come along and I’ll take you on a forest adventure day or a children’s expedition. At Easter, we’ll even head out on a nest and egg hunt during the Oberstdorf Easter games. Successfully collect at least 10 stickers and answer all the questions to receive a little surprise from the Tourist Information Offices in Oberstdorf and its districts. And don’t forget – my activity book is valid indefinitely, so you can enjoy adventures and busily collect stickers during several holidays – in both summer and winter. Diverse, exciting and family friendly – the six large hiking areas in Oberstdorf and the Kleinwalsertal Valley offer unique mountain experiences for people of all ages. This summer, Nebelhorn, Fellhorn / Kanzelwand, Söllereck, Heuberg, Walmendingerhorn and Ifen once again offer a broad range of options. Fellhorn / Kanzelwand border region This well-known floral paradise is the ideal destination for families with children and anyone who wants to expe­rience the mountains at first hand. Gentle circular hiking trails, streams, mountain lakes, an educational flower trail, mountain summits and magnificent views make for an unforgettable visit. The Burmiwasser discovery trail on the Kanzelwand is a particular favourite with children. Mountain restaurants with large sun terraces provide plenty of refreshments, while the Bergschau 2037 natural discovery centre in the Fellhorn summit station offers interesting information and spectacular views. Heuberg The Heuberg chair lift whisks you up to the mountain station at 1,380 metres. High up yet not in the high Alps, a spectacular view of Hirschegg and Riezlern awaits you. The Kleinwalsertal Valley lies at the foot of the mountain, which also offers numerous mid-altitude ridgeways for you to hike or walk along, as you prefer. This is also a popular region for mountain bikers, who can enjoy a diverse network of natural routes in a spectacular mountain setting. They, too, can reach the summit on the chair lift – without any extra charge for their bike. Nebelhorn The spectacularly beautiful Nebelhorn in Oberstdorf is known for its impressive views of 400 mountain summits. The summit restaurant at the top of the Nebelhorn offers a 270-degree panorama for meals with the best views. The view from the Nordwandsteig (north face walkway) is also breathtaking, with impressive sights way down below and far into the distance – your gaze will travel 600 m along the Nebelhorn north face and down steep drops. The Nebelhorn is the starting point not only for easy walks and wheelchair and pushchair-friendly circular trails but also for high-Alpine tours and the Hindelanger Klettersteig (via ferrata). Young visitors simply love the unique “Uff d’r Alp” (“Alpine discovery”) nature trail as well as the climbing wall and huge playground. The easily walkable Höfats trail from the Höfatsblick cable car station to the Zeigersattel reveals what makes the high mountain so special. Informative stations answer questions about geology, flora and fauna. The large Marktrestaurant at the Höfats­blick cable car station, the summit restaurant and the glazed “Gemsnest” panoramic restaurant all offer mouthwatering meals. Ifen There’s plenty to do and see in this rocky region, which fascinates visitors, not only with its magnificent rock formations but also the impressive Gottesacker karst plateau. In the summer, the middle station of the new Ifenbahn cable car at 1,586 metres is the starting point for walks, hikes and challenging day trips. Food and drink can be enjoyed at the Ifenhütte, which overlooks the children’s playground and the Kneipp pool. Söllereck On the Söllereck family-friendly mountain, the year-round Allgäu Coaster toboggan run offers plenty of fun and excitement, while the nature trail with its many interactive stations invites you to experience the flora and fauna of the Allgäu Alps. Söllis Kugelrennen, the world’s longest wooden marble run, provides great entertainment and makes the hike from the summit to the valley station fly by. Those who want to reach for the sky will find the perfect conditions for doing so in the Söllereck climbing park. The summit pass is valid for 7 or 14 consecutive days from the date of sale on the Nebelhorn, Söllereck, Fellhorn, Kanzelwand, Walmendingerhorn, Ifen, Heuberg and Zaferna . Pay once and experience 7 or 14 days or unlimited enjoyment of various attractions! The “GUT” ticket is valid for all mountains serviced by the OBERSTDORF · KLEINWALSER­ TAL BERGBAHNEN, as well as for the Breitachklamm Ravine. These leisure attractions are easily reached using the free Oberstdorf-Kleinwalsertal Valley bus services. Great family offers – don’t miss out! Only the first child in a family has to pay (must have been born between 2001 and 2012 and must be accompanied by an adult). All other children in the family travel for free this summer! Children born in 2013 or after also go free. Both offers are exclusively available from Oberstdorf • Kleinwalsertal Bergbahnen (cable cars) and participating host businesses (not from the Oberstdorf Tourist Information Offices). During the promotional period, free tickets for the Oberstdorf · Klein­ walser­tal Bergbahnen can be booked through the hosts in Oberstdorf. Enjoy unlimited cable car travel as often as you like with views over the Allgäu Alps. Even at 2,000 metres, there are many easy hiking routes. The Kleinwalsertal Bergbahnen make reaching them effortless too. Enjoy an unforgettable hiking holiday in Oberstdorf. Trail running Sporty mountain and cross-country running in and around Oberstdorf Check out the varied trails around Oberstdorf and experience the spectacular natural landscape of the Allgäu Alps. With three altitude levels and varied routes, Oberstdorf is ideal for trail runners of all standards – beginners, intermediates and professionals alike will all find optimum places to run. This beautiful trail heads past the Moorweiher Lake towards the Trettachtal Valley. A panoramic route above Oberstdorf with views of the Illertal Valley. A summit experience with far-reaching views and the crossing of a ridge. Route description: Mühlenbrücke Bridge > Moorweiher Lake > Oberstdorf golf course > Grubenweg > Oberstdorf Tip: this route is also ideal for running groups as it sticks to wide trails and paths. Tip: if the final downhill section through the Gaisalptobel Ravine is too demanding, you can also follow the road for a gentler descent. Oberstdorf’s valleys are characterised by glacial drift from the latest ice age, which has been ongoing for 2.5 million years and has included both cold and warm periods. During the coldest of these, the glaciers in the Oberallgäu reached heights of up to 2,000 metres. Only the highest summits in the Allgäu Alps protruded from the ice. The valley glaciers from Oberstdorf’s large side valleys gradually crept south, forming the terrain we see today (such as the Stillachtal Valley). Smaller side glaciers were unable to embed themselves as deeply and so created many little side valleys at a slightly higher altitude (such as the Dietersbachtal Valley). As the glaciers receded, emergent watercourses at their intersections formed deep canyons and ravines, like the present-day Hölltobel Ravine. At the end of the valleys, you’ll find impressive traces of the former valley glacier – steep, semi-circular trough heads, many of which tower to several hundred metres in height. From Oberstdorf in all directions Oberstdorf’s side valleys and districts promise nature at its best and wild village romanticism Nestled between steep mountain forests, the valleys are closed off to excursion traffic and offer completely undisturbed peace and quiet in a wild and romantic natural setting. The most stunning hiking and excursion opportunities invite you to explore. In the Stillachtal Valley, you will not only find Germany’s most southerly inhabited village of Einödsbach, but also the beautiful hamlet of Birgsau. Other attractions include the Fellhornbahn cable car and the Heini Klopfer ski flying hill in its newly renovated form, inviting you to pay a visit. The neighbouring Trettachtal Valley also has plenty to offer. Not only do the mountain farmers’ village of Gerstruben and the Christlessee Lake make this a popular destination, but the pretty hamlet of Spielmannsau also invites you to enjoy a leisurely hike. You’ll pass by the Kühberg on the way to the Oytal Valley. The tree-lined lane takes you to the Gasthof Oytal restaurant, where the valley widens to offer a panoramic view of the mountain landscape. On your return, you can give your legs a rest by heading back out of the valley on an Oytal scooter. The romantic Rohrmoostal Valley – with southern Germany’s oldest wooden chapel – is also worth a visit. Located in the Tiefenbach district, this hiking paradise has long-since belonged to a principality. Yet it is not just the Rohrmoostal Valley, but also the impressive Breitachklamm Ravine that make the picturesque district of Tiefenbach well worth a visit. The districts of Rubi, Reichenbach and Schöllang are characterised by peace and tranquillity. Located at high altitude above Reichenbach, the Gaisalpe restaurant offers spectacular views of the Allgäu Alps in both summer and winter. Rubi is known for its long hours of sunshine and many cosy eateries. Not far from Schöllang is a picturesque mountain church, where you can enjoy a breathtaking view of the area. The district of Kornau, located above Oberstdorf, offers fantastic views to the south. This village is characterised by cosy, private accommodation and historic chapels. Adjacent to this is the Söllereckbahn cable car, which invites young and old on adventurous excursions. Christlessee Lake In the heart of the Trettachtal Valley, by the hamlet of Gottenried, this beautiful, legend-shrouded mountain lake with its blueish green water sits at an altitude of 916 metres. Just to the south of the lake are power­ ful springs, which feed clear water into the lake, giving it good drinking water quality. This explains the lake’s unique character, which is also what makes it so mysterious – even in severe minus temperatures, the Christlessee Lake doesn’t ever freeze. The lake’s clear water can therefore be marvelled at in liquid form at any time of the year. The Christlessee Lake is within easy walking distance of Oberstdorf’s Mühlenbrücke Bridge, from where a path leads past Gruben and Gotten­ ried to the idyllic lake in the Trettach­ tal Valley. Source of the Iller The source of the Iller is located in Oberstdorf, where it is formed through the confluence of the Trettach, Stillach and Breitach. As it starts to head north, the Iller winds its way through the Allgäu past the towns of Sonthofen, Immenstadt and Kempten. During the second half of its journey, the Iller flows through Upper Swabia, roughly marking the state border between Baden-Württemberg and Bavaria, before joining the Danube in Ulm and continuing on to the Black Sea. The Breitach’s source is in the Kleinwalsertal Valley, while the sources of the other two tributary rivers, the Trettach and Stillach, are located in Bavaria. The Iller’s source is within easy walking distance of Oberstdorf, just by the “in form park” fitness centre to the north of the village. The four rivers circular hike takes you off the beaten path and along the banks of Oberstdorf’s three mountain rivers – the Breitach, Stilllach and Trettach – as well as past their confluence at the source of the Iller. From the roundabout at the entrance to town, a short stretch of road takes you to Karweidach. The Trettach runs alongside the road as the wildest of the three mountain rivers. A short causeway leads to the source of the Iller. Here, the mountain rivers that surround Oberstdorf come together to form the most powerful body of flowing water in the Oberallgäu region. The hike continues along the Iller River to the Illersteg Footbridge near Rubi. Once you’ve crossed the Iller, the causeway returns to the river’s source, this time offering a view of it from a different perspective, then on to the Breitachdamm Dam and the Breitachbrücke Bridge. After crossing the latter, the well-developed return route briefly runs parallel to the main road before branching off to the right towards the south after a few metres. Here, the gently flowing waters of the Stillach River pleasantly accompany you on your way. versus the vertically climbing rock faces with their abundance of water. If you like, the hike can now be extended to the end of the valley at the foot of the Höfats. The route back to Oberstdorf initially retraces its steps before heading back down the well-maintained Alpine road out of the valley. Passing the picturesquely located Kühberg, you return to the hike’s starting point. By choosing to descend along the road, you can also incorporate a visit to the Audi Arena in the last few metres of your hike. Useful info: The Oytalhaus mountain restaurant rents out mountain scooters from 3 p.m. on dry days. In addition to being great fun, descending on a scooter is also a convenient and welcome way to rest your tired legs. Swabian writer’s place of work. Arthur-Maximilian Miller was one of the most important popular German writers of recent times. Even during his lifetime, his works, which are known for their impressive intellectual content, especially with regard to the eternal questions of mankind, and their great literary quality, brought fame to the poet well beyond the borders of Swabia. The collection of poems in the Haus Bonatz has been almost fully preserved. Miller’s most famous works include “Die schwäbische Weihnacht” (“A Swabian Christmas”). After his death on 18 February 1992, the district of Swabia took over his estate. Today, you can visit his home and place of work in almost unchanged condition. The Haus Bonatz is open every Sunday from 3 p.m. to 6 p.m from April to early November.  Family-friendly hikes A family holiday in the mountains offers all sorts of ways to bring children closer to nature. With the proper preparations and equipment, a family hike is an unforgettable experience that your children will talk about for years to come. What age – which route? What children can manage at what age and how to motivate them 1 to 3 years Small children in this age group can be taken on hikes in “child carriers” – carrying frames that go on your back. Please don’t forget that this only allows them limited movement. Depending on the weather, they are therefore more susceptible to becoming cold, overheating or getting sunstroke. As such, the right clothing is extremely important. Put a warm or sun hat on the child and take breaks at least once an hour to allow the child to move around freely out of the carrier. Limit hikes with small children to a maximum of three to four hours. 4 to 6 years This age group is looking to awaken their love of hiking. You should therefore initially keep routes to between two and four kilometres or one hour. By doing this, you can expect your children to actually walk the whole way rather than having to be carried home again. Backpacks for preschoolers should be no heavier than one kilo. There is no need to constantly entertain four to six-year-olds as they like to explore areas for themselves. 7 to 12 years Children in this age group can cope for two to three hours, with distances of five to ten kilometres and with backpacks weighing three to five kilogrammes. But it’s at this age that children tend to cover a lot of the route at speed, running back and forth, off the trail into the forest and back again. Towards the end of the hike, they often hit the “go slow” phase due to sheer exhaustion. A tip: it’s often good if your children have friends with them as they keep each other in a buoyant mood. 13 to 16 years This is the most difficult hiking age. In theory, teenagers can walk 20 kilometres, keep going for five hours and carry five to seven kilogrammes. It’s not just the hiking itself that appeals to this age group – they also like to combine this with adventurous activities such as rafting or mountain biking. via Gruben on a scenic route with plenty to see and an array of cosy places to stop off for a break. Useful info: Of course, you can also follow this route in the opposite direction. If doing so, the Moorbad swimming pool with its healthy, natural moor water offers plenty to keep children entertained, while a blissful sun terrace provides a welcome place to stop at the end of the hike – not just for swimmers and families. towards Reichenbach. Follow the signs and you’ll soon reach the forest playground. The second (more pushchair-friendly) option takes you off to the right in Rubi, along the meadow path to Reichenbach. You essentially pass your destination for the day along the way. The forest playground itself offers a variety of beautifully created and natural play stations from the double-decker bus and Formula 1 car made from tree trunks to a forest bowling alley and an Indian tepee. Mums and dads can enjoy pleasantly shaded seats. The return route leads through Rubi (for people with pushchairs who reached the forest playground via the meadow path, you initially retrace your footsteps) and along the sunny meadow path with its lovely views back to the Dummelsmoosbrücke Bridge at the edge of Oberstdorf. One option for hot summer days could be to end your hike with a visit to the Moorbad swimming pool in Reichenbach. but you must be physically fit and sure-footed, and you also need to secure the pushchair as a safety precaution. Buses regularly return to Oberstdorf from Reichenbach and Rubi. There are also places where you can stop off for a bite to eat. For more information about this topic, visit www.oberstdorf / familienwandern. Family time Enjoy unforgettable holidays in Oberst­dorf, where there’s something to do whatever the time of year or weather. As all attractions in and around Oberstdorf are quickly accessible, you can make your holiday varied and combine different interests. Fun and relaxation for the whole family, whether on adventurous hikes or group excursions, are guaranteed. Agriculture in Oberstdorf The Oberstdorf “Gassenkühe” (literally “lane cows”) are first put out to pasture in the spring. From early May to mid-September, the cows are driven to their pastures through Oberstdorf’s lanes. After the long winter, the animals are visibly keen to spend their days grazing in the lush pastures again. Wiggling ears and raised tails are clear signs of happy cows – and ones that can be seen by anyone who finds themselves in Oberstdorf’s lanes in the mornings and evenings. This is when the “Gassenkühe” are driven along these lanes to and from the Oberstdorf community pastures on the northern and southern edges of the town. The cows belong to several farmers. They know which stall is theirs and can practically find their way back to it on their own. You can hear the “Gassenkühe” approaching from far away, thanks to the sound of the bells they wear around their necks. There are two types of bell, each with a different shape and sound. Large, round bells resembling those used as orchestral instruments are worn by milk-producing cows. Young cattle, on the other hand, wear smaller bells with an oval shape and a deeper tone. Throughout the year, cattle wear “grazing bells”, which are small and light and are held in place with simple leather straps. It is only during the “Viehscheid” cattle drives that they wear the special ceremonial bells that are bigger, more decorative and more colourful. Layers of spotted marl deposits form the base of the Allgäu’s central main ridge and give rise to particularly fertile and quick-drying soil. As a result, most of the lush and green farmed Alpine pastures with cattle are situated on this subsurface. Boggy wet meadows and straw meadows with many rare flowers and deep ravines are typical signs of a “flysch zone”, an area primarily made up of clay and sand stone. In the west, the rainwater turned the Schrattenkalk formation in the Gottesacker area into one of the most extraordinary karst landscapes in the Alps. The almost complete lack of vegetation, the deep fissures and the rock crevices as well as the razor-sharp rock formations are all reminiscent of a fossilised glacier. From a distance, it can be compared with a sad, grey and endless cemetery or “Gottesacker” in old German. Freibergsee Lake Located 930 m above sea level, the Freibergsee Lake has a water surface of around 18 ha, making it the Allgäu’s largest high mountain lake. bathing destination. People of all ages delight in the water temperatures of up to 25 °C in Germany’s southernmost natural swimming pool. The lake has a maximum depth of about 25 m and no visible inflows and outflows. Instead, these are located underground and regulate the periodically fluctuating water level. The large lakeside lawn and the wooden terrace by the Freibergsee natural swimming pool are the perfect spots for a little sun bathing, while children can enjoy the play­ ground. Rowing and paddle boats are also available for hire. A restaurant with a large terrace overlooking the lake and a wide selection of dishes and local specialities provides all the refreshments you could need. Gerstruben An unmistakeable fusion between tradition-steeped cultural heritage and tourist attraction in the Dietersbachtal Valley. Gerstruben can be regarded as Oberst-­ dorf’s history book of mountain farming. The former Alpine village and agricultural gem today has five houses of between 400 and 500 years old, a traditional “Sennküche” restaurant, the old saw mill and a chapel. Until the end of the 19th century, the historic mountain settlement was still home to several farming families. With its sun-browned timber buildings and surrounding mountain landscape, it is now a truly unique setting. The buildings have been lovingly restored and preserved for posterity in an exemplary manner. The Jakobe-Haus, a farmhouse preserved almost completely in its original form, is open to visitors every Thursday and Saturday between May and October from 1 p.m. to 4 p.m. The picturesque little rooms and chambers are truly enchanting. Einödsbach One valley on, at the foot of a breath­ taking mountain backdrop, the small village of Einödsbach marks the edge of the Stillachtal Valley. The Einödsbach mountain inn is Germany’s southernmost permanently inhabited building. The former village was originally made up of three houses and a chapel, built in the tightest of spaces and surrounded by the impressive massif of the Allgäu’s main ridge. Today, only the inn is permanently inhabited. Records of there being a settlement here date back to 1613. It’s also worth taking a brief detour to the Chapel of Saint Catherine, which can be reached by following the road up from Birgsau. To the east, a hiking trail runs through the Bacherloch Gorge up to the Walten­ berger Haus. To the south, the route leads into the Rappenalptal Valley. Suggested hikes To the Gaisalpe via the Walraffweg Length: 9.7 km	Elevation gain: 395 m Duration: 4.5 hours This multi-faceted hike begins by heading past the Audi Arena up to the Breitenberg. From here, the Wallrafweg trail climbs further uphill on the western side of the Rubihorn.The dense coniferous forest provides lots of pleasant shade without obstructing the plentiful stunning views of the Illertal Valley that can be enjoyed along this section. This popular trail is named after Max Wallraf, President of the Reichstag of the Weimar Republic and Lord Mayor of Cologne, who was a regular visitor to Oberstdorf and initiated construction of the route. Once you reach the Gaisalpe, at an altitude of 1,149 m, your efforts will be rewarded with a picturesque panorama of the mountains and a sweeping view of the AllgĂ¤u. Here, at an end point in the hiking trail network, many mountain paths climb higher into the Alpine trail network of the Oberstdorf mountains, which demands a higher level of equipment and experience . The mountain route from the Nebelhorn via the Gaisalpsee Lakes, which joins the hiking trail network at the Gaisalpe mountain restaurant, is a particular favourite. On the return route, you begin by retracing your steps back to the tiny Gaisalpkapelle chapel. At this point, you can choose between two possible descent routes. The ravine trail down into the valley requires sturdy walking boots and sure-footedness but offers a very pleasant experience of being close to nature, deep within the ravine of the wild Gaisalpbach mountain stream. The well-developed road, on the other hand, offers a much more comfortable and less challenging option. Once it reaches the valley, the trail takes you through scenic meadow paths back to Oberstdorf via Rubi. Useful info: Local conditions mean that the path is often wet in the vicinity of the ravine trail. Sturdy, ankle-high walking boots with a good tread and sure-footedness are recommended for this route. If in doubt, we recommend going in the opposite direction and ascending via the ravine. with each metre you cover. The last few metres to the mountain restaurant involve another steep climb. If you choose to make the demanding excursion to the picturesque Traufbachtal Valley, you will be rewarded with impressive views of a valley that is off the well-worn tourist trail. Starting in Oberstdorf, this trail brings you through the hamlets of Gruben and Dietersbach in the direction of Spielmannsau. On the return route, you retrace your steps until you come to a fork in the trail. Here, you can choose between the ravine trail you took on your ascent and the Alpine road. The ravine trail is for those who prefer to be closer to nature – and is also the shorter option. The alternative route is along an asphalted road, consisting of a steep, winding section climbing upwards until you reach a saddle. At this point, you begin an equally steep descent into the valley on the other side of the Traufberg. You will be rewarded with a view into the southernmost point of the Trettachtal Valley and the option of visiting the Alpe Oberau, shortly before the circular trail comes to an end in Spielmannsau. Useful info: Sturdy, ankle-high walking boots with a good tread, as well as sure-footednessand a decent head for heights are essential when tackling the ravine trail (Alpine climb). The return route via the Alpine road includes some challenging uphill and downhill sections. It is advisable to bring drinks and hiking sticks.  From the Freibergsee Lake to the Heini-Klopfer ski flying hill discovery trail Discovery trail duration: 45 minutes Suitable for children aged: 4 and above Suitable for pushchairs? Yes, pushchair parks are provided on the discovery trail Get up close to the action and feel like a ski flier. The Heini-­ Klopfer ski flying hill mountain station is only about half an hour’s walk from the Freibergsee Lake. Alternatively, you can ascend to the ski flying tower from the stadium below in the comfort of the new, disabled-friendly hillside lift. At the top, you can look out over the entire complex. You’ll also find a kiosk, pushchair park and multiple seats. The tower lift takes you some 70 metres up into the air to the eagle’s nest – the striking new warming room at the top of the ski flying hill. From here, you can access the two viewing platforms with an impressive 360-degree view – a unique experience for people of all ages. The new discovery trail around the ski flying hill’s mountain station is a great way to experience the fascinating sport of ski flying. Pushchairs can be left at the entrance to the complex and the path takes you straight through the site to the competition judges’ tower. Immerse yourself in the unique world of ski flying and discover detailed information about the milestones of the sport’s development and the Oberstdorf ski flying hill. Useful info: The site has plenty of benches where you can rest your legs and relax a while. They are ideal for picnics, for taking a breather or simply for enjoying the view. You can also follow the route in the opposite direction. Start your day with a visit to the Heini-Klopfer ski flying hill, followed by a short hike to the Freibergsee Lake, where you can cool off and enjoy some fun in the water. runs through a picturesque valley between the cable car station and the “hintere Seealpe”, where food and drink are temporarily served during the Alpine summer. Varied and lovingly crafted interactive stations teach both children and adults plenty of fascinating facts about nature, the mountains and, in particular, the Alpine economy around Oberstdorf. Useful info: Due to the well-developed and largely flat nature of the trail, this family-friendly circular route is even recommended when the weather is not so great. huts are managed by the farmers’ families. Visitors can try the products directly on-site. What could be better than a hearty snack of bread and cheese washed down with a glass of milk to sate your hunger and thirst when hiking? There are also locations where dairy products are not made but that are still well worth a visit. Combined with a hike or a hearty snack made from local products, an unforgettable experience is guaranteed. Subject to change. Restaurant opening periods depend on the cattle drives to and from the Alpine pastures. These will occur no earlier than the start of May and no later than the end of October respectively. ... and make your holiday to a very special one. The Main Dolomite is a primary rock formation in the limestone Alps and one of the oldest types of rock in the Allgäu Alps. Some 200 million years ago, the layer of stone formed on a subtropical mud flat that was hostile to life. Although originally deposited the deepest, it was pushed up on top of all newer earth and rock layers when the fold mountains were formed. Today, the Main Dolomite forms the huge rocky and impressive peaks of the Allgäu’s central main ridge from the Hochvogel to the Biberkopf and Widderstein. Also characteristic of the Allgäu Alps are the extremely weatherr­esistant aptychi layers. Together with the spotted marl limestones, which are also extremely long-lasting, these were raised up during the creation of the Allgäu Alps and modelled through the weathering of the softer rocks that surrounded them. Especially in the case of the summits and rugged mountain ridges of the Höfats and the Schneck, this resulted in the mountains that are characteristic of the Allgäu Alps. Nowhere else can these kinds of summits be found as predominantly as in the Oberstdorf mountains. Restaurants, lodges and climbs All of the mountain restaurants and lodges around Oberst­dorf have one thing in common: a unique and spectacularly scenic l­ ocation in the heart of the Allgäu Alps. Around Oberstdorf, you’ll find seven German Alpine Club (DAV) shelters and one private mountain refuge. Most of these are directly located in the area of the Allgäu’s central main ridge. Multi-day hikes The Allgäu Alps are known for their diverse landscapes. There are few places where you’ll find huge rocky mountains like the Trettach right next to steep grass mountains like the Höfats. Well-maintained mountain paths, ridgeways and via ferratas with no less than seven different shelters enable you to enjoy this unique landscape, Swabia’s largest nature reserve, to the full. Depending on weather conditions, the rustic mountain lodges are generally open from mid-June to mid-October. Some, however, open as early as the end of May. Seven lodges are located within a day’s climb of Oberstdorf. From there, you can choose between nine connection routes of varying levels of difficulty. E5 – from Oberstdorf to Merano: The hike across the Alps along the E5 European long-distance hiking route from Oberstdorf to Merano is a truly unforgettable experience! Framed by the sometimes charming, often imposing and, in many places, magical and awe-inspiring mountain landscape, this route is a true Alpine highlight! Mindelheimer Hütte – Rappenseehütte The standard route leads along the Schrofen Pass and the Mutzentobel Ravine and offers plenty of spectacular views but is also very exposed in parts. Although a technically simple route, it certainly gives your thighs a workout. Heilbronner Weg Rappenseehütte – Waltenberger Haus Follow the best known ridgeway in the Allgäu Alps, making your way along sections with protective steel cables over mostly rocky terrain. Sure-footedness and a good head for heights are prerequisites for this via-ferrata-like ridgeway. Via the Bockarscharte 5 hours, 664 m elevation gain, 4.24 km. Enzianhütte – Rappenseehütte The short but picturesque route starts with a gentle uphill section along an often pleasantly shaded trail to the Musskopfsattel before a following steeper, sunny section of winding trail to the Rappenseehütte. Kemptner Hütte – Prinz-Luitpold-Haus A particularly demanding daily stage that requires excellent fitness but impresses with not just the Höfats – the landmark of the Allgäu Alps– but also the sheer natural diversity. Waltenberger Haus – Kemptner Hütte A demanding climb leads to the Bockarscharte. From there, it takes you across snowfields at the foot of the Mädelegabel and then through magnificent mountain meadows to the Mädelejoch. Prinz-Luitpold-Haus – Edmund-Probst-Haus This scenic route between lodges offers a unique experience in terms of Alpine flora. With several exposed sections, it requires both sure-footedness and a head for heights. At the Laufbacher Eck Length: 18.6 km	Elevation gain: 547 m uphill, 1,640 m downhill Duration: 8 hours The ridgeway around the Laufbacher Eck and along the 2,000 m border is among the most beautiful the Allgäu Alps have to offer – thanks to its stunning views and spectacular flora. At the same time, this long route demands sure-footedness, a head for heights, Alpine stamina and proper equipment. full attention on the first few metres. It’s not unknown for hikers to encounter deposits of old snow here well into the spring season! This section is followed by an easier path that takes you below the impressive east face of the Schneck to the Himmelecksattel. As you cross into the Oytal Valley, you’ll enjoy a perfect view of the contrast between the lush, green slopes of the flysch mountains with their blankets of flowers and the rugged rock massifs of the Main Dolomite. The subsequent descent to the Käseralpe via the expansive Wildenfeld ridge is steep and long and good trekking poles are certain to come in handy at some point along this section. From the charming Alpine pastures of the Käseralpe at the foot of the Höfats, this route then follows well-developed hiking trails out of the valley via the wonderfully refreshing Stuibenfall waterfall and the Untere Gutenalpe. Shaded lanes lead from the Oytalhaus to the Kühberg. Along the last few sunny metres of this route, you’ll get your first glimpses of the rooftops of Obserstdorf. A  s an alternative to walking back to Oberstdorf, scooters can be rented from the Oytalhaus from 3 p.m.
 Border stone 147 – cycling and hiking to the southernmost point in Germany Length: 37.3 km	Elevation gain: 1,050 m Duration: 7 hours Hop on a bike and head from the south of Oberstdorf past the impressive ski flying hill and the Fellhornbahn cable car to deep into the Stillachtal Valley. As long as you keep an eye out for pedestrians, cycling along the hiking trails is the more leisurely option but you’ll make quicker progress along the quiet roads. Behind the Alpe Eschbach at the end of the Stillachtal Valley, the Buchrainer ascent climbs steeply up to the entrance of the Rappenalptal Valley above. In the picturesque side valley, a tarmacked Alpine road heads up a largely gentle slope to the Biberalpe farm. Cyclists can extend the route via a steep, winding section up a gravel road to the Speicherhütte. From here, an Alpine climb leads to the Trifthütte, the southernmost building in Germany. Here, in the midst of the many flowers and remote mountain landscape, a few marmots enjoy the idyllic tranquillity. Despite its touristic importance, the southernmost point of Germany is rarely visited due to its remote location in the mountains. The last few metres are steep and rocky so concentration and sure-footedness are essential! You will then have reached your destination for the day – border stone 147. The quickest route back is to return the way you came. The first steep descent requires plenty of concentration, but once past this you can enjoy picturesque views over the entire Rappenalptal Valley and the impressive Trettach­ spitze. Those who worked hard and pedalled their way into the valley are now rewarded with a leisurely and effortless descent, as the return through the long Rappenalptal Valley follows a slight downhill almost all of the way. A stop at one of the rustic mountain restaurants is a great way to round off your visit to the Rappenalptal Valley. Useful info: Border stone 147 marks the southernmost point in Germany and therefore the border between Tyrol, Vorarlberg and Bavaria, or in other words Germany and Austria. Despite its touristic importance, few people visit the border marking due to its remote location. anemones) with their distinctive seed heads, as well as a host of other mountain flora, some of which are rare and protected species, will delight the hearts of flower enthusiasts. From the Schlappoldeck, the route follows the ridge downhill to the Söllereck, offering scenic views of Oberallgäu. High above the Söllerwanne, the trail includes an exposed section – once again with steel cables for safety – where sure-footedness and a head for heights are essential. The descent leaves the ridge at the Söllereck. From here, the route takes you along a short, winding downhill stretch to the Söllerealpe. Passing by the Sennalpe, the trail offers plenty of variety and ends with a nice easy stretch that brings you to the Schönblick mountain restaurant and lodge. From the Söllereckbahn mountain station, you can choose from a number of different descents into the valley. Alternatively, you can relax and give your knees a rest in the comfort of the Söllereckbahn cable car. snack to keep you going. The day trip is recommended for children aged seven and above. Hiking tours with children are largely dependent on the little ones’ motivation and a good amount of fun and adventure. and a via ferrata experience of the purest kind are guaranteed. The via ferrata is presented in detail on the next page. The demanding route provided by the cross-border sports via ferrata with exposed traverses and strenuous climbing sections will challenge even experienced climbers and mountaineers. The Heilbronner Höhenweg on the Allgäu’s main central crest has been one of the Alps’ most stunning and popular ridgeways for over a hundred years. Schafalpenkopf via passages with safety cables. These bring you to a footbridge, spectacular views of which can be seen from the terrace of the Fiderepasshütte. Crossing this bridge is likely to prove less dramatic than you might think! The via ferrata then brings you via a vertical rockface to the Middle Schafalpenkopf. When crossing the middle summit, you will encounter some exposed ridge sections. When you reach the Southern Schafalpenkopf, your route takes you over a steep grass slope and a ladder that descends all the way down to the end of the via ferrata. At the bottom of the ladder, the route proceeds through sun-drenched pastures to the Kemptner Köpfle. Once you pass through the Kemptner Scharte, you don’t have long to go till you reach the Mindelheimer Hütte. Useful info: This via ferrata is considered challenging due to its length, even though it is only classified as moderately difficult to difficult by international standards. For safety, the route has many protective wire cables along the route (spread over approx. 400 m), as well as several grips and pegs and a number of steel ladders. Although there are many short steep sections, as well as some longer ones, there are only a small number of points that are very exposed. Via ferrata taster courses An exceptional programme for adventure-loving visitors From early July to mid-October, Tourismus Oberstdorf and the Oberstdorf Alpine schools come together to offer a via ferrata taster course. Information and booking Meeting point: Fellhornbahn valley station Cost: €62 for Oberstdorf visitors with an Allgäu Walser Premium Card and Oberstdorf locals; €72 for visitors staying in the surrounding villages with an Allgäu Walser Card. Ankle-high walking boots with a good tread and weather-­ appropriate clothing are essential for this tour. Please also remember to bring enough food and drinks. As the tour takes place in Alpine terrain, sure-footedness and a good head for heights are required. After ascending on the Fellhornbahn cable car, we continue on foot to the Kanzelwand mountain station. Here, you experience the taster via ferrata on the Warmatsgundkopf before we continue as a group past the ruins of the Roßgund­alpe back to the Fellhorn area. After a leisurely break at the Alpe Bierenwang, we take the Fellhornbahn cable car back down into the valley. Zämed duss (“Sharing the outdoors”) The “Zämed duss” (“Sharing the outdoors”) campaign subtly encourages people to treat one another with respect. It also aims to remind people that they are all out and about for the same reason – to enjoy nature. After all, we all want to “share the outdoors” for as long as possible. Alpine farming in Oberstdorf: young stock pastures Some 1,400 young cattle spend their summer on the Oberstdorf young stock pastures or “Galtalpen” Young cattle aged between one and three years that do not yet produce milk are also classed as young stock. As summer progresses, the farmers drive the young stock ever higher into the mountains, from one “Galtalpe” to the next. 2,000 m above sea level. There are no roads or paved routes to these pastures; the farmers must carry any necessary belongings and food themselves. As a result, the herds of cattle are often accompanied by donkeys, which are used as packhorses. Unlike “Sennalpen”, where the cows’ milk is processed on-site, cattle on the young stock pastures are left to their own devices. As such, young stock pastures normally don’t offer any gastronomy. Unexpected snowfall in high summer is a frequent pheno­ menon in the Allgäu Alps. This change in weather can sometimes be dangerous for the animals. Constant rain softens the ground so the cattle can no longer find a firm footing. Additional helpers are then required. The Alpine summer traditionally ends with the “Viehscheid” cattle drive, when the young cattle are driven back down into the valley from the young stock pastures. On reaching the “Scheidplatz” (literally “dividing place”), the herd is divided up and owners can guide their young cattle back to their own stalls. For more about the “Viehscheid”, turn to page 60. Take off those hiking boots and get ready for your next adventure. Enjoy the many facets of summer in Oberstdorf away from hiking trails. The wide range of indoor and outdoor activities offers guaranteed fun for people of all ages. Plan your summer holiday in Oberstdorf in line with your specific needs. Although the trail through the Breitachklamm is well protected, sturdy footwear is still a must! Informative film Visit the cinema room at the entrance to the Breitachklamm and watch the free and impressive film. This provides lots of fascinating information about the creation and ecology of the natural spectacle. Paragliding Enjoy Oberstdorf from the air Hang-gliding and paragliding enthusiasts find the best conditions in Oberstdorf. A specialist school offers a basic course that gives you the knowledge and skills you need to fly at low heights on your own or an advanced course to enable you to ascend to all heights. Want to try out the experience of “free flight” but don’t trust taking to the skies on your own? Then a tandem flight with an experienced pilot is the ideal solution. White water sports Adrenalin-packed sessions White water sports fans will simply love it here in Oberstdorf. Regional schools offer kayaking and canoeing courses as well as rafting and canyoning tours. Pure excitement awaits you on the rivers and in Oberstdorf’s ravines. A list of providers can be found on page 86. Tradition and modernity, custom and culture all come together in a very special way in Oberstdorf. Embark on a journey of discovery and enjoy new experiences. The villages, valleys and centre all have their own charm and offer impressive diversity. the few crown makers to still use traditional methods to create the decorative headdresses worn by the finest cow in each pasture during the end-of-season cattle drive. The mirrors integrated into the headdress are said to ward off evil spirits from along the wayside during the procession. The lead cow is always pre-selected up on the pasture on the basis of certain ideals of beauty. However, only if all the cattle on a pasture have been free from illness, falls or other strokes of bad luck throughout the entire summer can this decorated lead cow be led to the herd separation point by the farmer. The Oberstdorf Viehscheid takes place annually on the 13 September, unless this falls on a Sunday, in which case it is postponed by a day. In 2019, this date falls on a Friday. The animals in the district of Schöllang usually return from the Alpine pastures on 12 September, subject to the same Sunday rule as above. In 2019, this date falls on a Thursday. with several special exhibitions. Enjoy the special flair and cultural works offered by the villa. Bergschau visitor centres The story of how the mountains were formed The Bergschau (literally meaning “mountain show”) uses a fun and active approach to tell visitors about the evolution of the flora and fauna of the Allgäu Alps, how the mountains were formed and the links between people and nature. One of the four Bergschau centres is located in the old town hall in Oberstdorf and offers basic information about geology, nature and culture in the Allgäu Alps. You’ll also find fascinating insights into the history of the glaciers, the cohabitation of plants and animals and how people make a living in the mountains. Experienced staff members will happily help you with any questions or if you want any additional information. In addition to the Bergschau visitor centres with permanent natural history exhibitions, in summer you can also visit eleven Bergschau outdoor information points and hike five Bergschau trails. Opening hours: Daily from 2 p.m. to 6 p.m.
Heimatmuseum Oberstdorf The mountain village museum The “Heimatmuseum Oberstdorf” (local history museum) is located in a 17th century period property in Oberstdorf. Fortune has it that, despite a major fire in 1865 and the modernisation craze in the 1970s, the original core of the building is still intact. The museum opened in the historic premises in 1932 and has been continually extended ever since. Exhibits show how the destitute inhabitants of our mountain village survived, farmed the Alps, led visitors up into the mountains and learned how to ski. You will also find the largest leather ski boot in the world – shoe size 480, over three metres long and one and a half metres high. The southernmost point of Germany Oberstdorf is part of the German “Zipfelbund” (Corner Point Association) What do the municipalities of Görlitz, List on Sylt, Oberstdorf and Selfkant all have in common? They are all part of the “Zipfelbund”, an association made up of the municipalities located at Germany’s geographical corner points. The Haldenwanger Eck, the southernmost point in Germany, is just a day’s hike from Einödsbach. Stamps from the four town halls or Tourist Information Offices can be collected in the passport-like “Zipfelpass”. Anyone who has visited all four corner municipalities within the space of four years and obtained the necessary passport stamps will receive a “corner point” package containing typical products from the four corner point regions. Anderl Heckmair providing insights into the geology and flora of the Allgäu Alps. For more than 30 years, he worked as a hiking guide for Tourismus Oberstdorf. The picture of happiness – Anderl Heckmair before embarking on the ascent of the Schneck east face, which he conquered in 1949. Even sustaining an injury in the process failed to hold him back. Anderl Heckmair, one of the most famous Alpinists in history, chose to make his home here in Oberstdorf, where he lived and worked as a mountain guide until his death in 2005. And he grew to the ripe, or rather, very ripe old age of 98, despite being one of the most extreme mountaineers of his day. In Alpine publications, he was often described as a daredevil, a risk taker and a fearless climber. One of his greatest endeavours, which earned him worldwide fame, was the first successful ascent of the notoriously difficult Eiger north face in the Bernese Oberland in Switzerland in the summer of 1938. But Anderl Heckmair was so much more than just the man who conquered the Eiger. It was, more than anything, the way in which he remained true to himself that made him really fascinating. Anderl Heckmair’s pursuits – extreme climbing, expeditions, travels and so much more – were so extensive and varied that it would simply take to long to list them all. However, the essence of the man can be summarised very vividly as follows – Heckmair was, through his actions, the very embodiment of the mountain experience, an ambassador for mountain nature in all its diversity. In the 1930s, he left his native Munich to come to Oberstdorf, where he married a local and had two sons. The elder, Andi, gained renown in Oberstdorf and beyond as a pioneer of mountain biking and the owner of a bicycle business, among other things. In the 1950s and 1960s, Anderl Heckmair took care of the youth hostel in OberstdorfKornau as an expert on Alpine information and worked as a ski instructor and as a mountain guide in the Allgäu. A multi-faceted village life is characterised by culinary and social evenings plus a traditional yet modern array of events. Musical entertainment meets sporting events to excite both visitors and locals. clubs, and at the Allgäu Golf & Country Club in Ottobeuren. To calculate the overall tournament score, the results from the four days of play will be added to the handicap-adjusted Stableford points awarded – this is the same system used by the ski jumpers in their tournament. As well as the individual rankings, there will also be a competition for teams of four. The supporting programme promises to be truly spectacular. For example, participants can look forward to a “nearest to the pin” competition from the jump-off platform of the Heini-Klopfer ski flying hill, with a prize of €50,000 for a hole-in-one. F or more information about the programme and to make a booking, visit www.vierplaetzetournee.de. 51st Nebelhorn Trophy in Oberstdorf 25 to 28 September 2019 Top figure skaters from Germany and across the globe will compete in Oberstdorf for the Nebelhorn Trophy. This is one of the most tradition-steeped figure skating competitions in the world, as well as being a welcome season opener for the stars of the sport and part of the prestigious Challenger Series established by the International Skating Union governing body. Many skaters use this event as an opportunity to try out their routines in front of an audience and judging panel for the first time. Many stars have already come to Oberstdorf for this event, including Aljona Savchenko and Bruno Massot, the latest gold medallists in the Olympic pairs figure skating event (who spent many years in the Allgäu preparing for their greatest triumph), as well as the women’s Olympic champion, Alina Zagitova from Russia. In addition, the competition is more than just an Olympic qualifier. This year will once again see prominent athletes and coaches gathered on the ice and at the rinkside and the German skating stars in particular will be eager to perform to a home crowd at the start of the season. Exciting singles, pairs and ice dancing contests will be followed by the much-loved ice show event to close the competition on the Saturday evening. This will feature a varied programme of exhibition skating. TISSOT T-TOUCH EXPERT sOLAR tactile. 20 TACTILE FUNCTIONS INCLUDING ALTIMETER WEATHER FORECAST AND COMPASS. This year’s patron introduces himself: Joachim Baldauf, the worldrenowned fashion photographer and publisher, who was born in the Allgäu and now lives in Berlin, is already very excited about acting as the patron of our photography festival and about presenting his “High Fashion” exhibition – exclusive to Oberstdorf – on the Nebelhorn. Photo: Marina Geckeler Joachim Baldauf (born 20 July 1965 in Weiler, Allgäu) is a German fashion photographer and publisher. He lives in Berlin and in the Allgäu region. In 1984, he began a course in Textile Design at the Otto-­ Johannsen Technical Institute in Reutlingen, which he completed in 1987. From 1989 to 1998, Baldauf worked as a graphic designer and art director for various magazines and companies. In 1992, he co-founded a communications agency for magazines. In 1998, Baldauf became a freelance photographer, focussing mainly on international magazines and advertising campaigns. He was responsible for creating numerous editorials and covers for London’s “Wallpaper”* magazine between 1999 and 2002. Walking dinner 2019 3 July 2019 Tantalise your taste buds! One of the main highlights of the year is the chefs’ “walking dinner” – an extraordinary and unique demonstration of culinary skills. The doors of the Oberstdorf Haus open at 6.30 p.m. with the promise of an exceptional evening ahead. The best culinary artisans from our region show off their skills and present amazing creations and flavour explosions during this event. Oberstdorf wine festival 15 to 18 August 2019 Join us in Oberstdorf to eat, drink and be merry! Our Rheinhessen vintners present the latest creations and fine wines in the Oberstdorf Kurpark. With the classic grape varieties of barrique and ice wine, as well as selected sparkling wines and distillates, there will be something to excite all wine connoisseurs. The wine festival is rounded off with tasty regional treats and fantastic entertainment from our carefully selected live bands. traditional pasta-like dish), knuckles, beer, wine, coffee and cake, Leberkäs (similar to meatloaf), pizza and all sorts of tasty snacks. And, of course, there are plenty of refreshments to be found across the entire village festival site. We hope that all visitors and locals have a great time! The village festival will take place whatever the weather. Entrance is free. Farmers’ and cheese market 29 September 2019 Oberstdorf will celebrate harvest festival with its farmers’ and cheese market in the centre of the village. A varied programme with lots of local products to sample will begin at 11 a.m. These not only include excellent Allgäu cheese but also many other regional specialities and rural handicrafts. Disabled access as a mark of quality and convenience at three altitude levels. Holidays for all people and all needs. With transport facilities, accommodation and leisure activities that are accessible and suitable for the disabled, as well as allergy-friendly facilities. Oberstdorf breaks down barriers. developed through several years of cooperation and coordination with the relevant associations and stakeholders in the tourist industry. F or further information and a list of companies as well as leisure services in Oberstdorf, please visit www.oberstdorf.de/barrierefrei and see our “Wohlfühljournal”. Holidays for allergy sufferers Do you suffer from allergies or food intolerances? Oberstdorf is home to many hosts and companies that devote themselves to the needs of allergy sufferers. products in order to protect their own landscape. Oberstdorf has been a recognised Kneipp location since 1964. The Kneipp-based understanding of a healthy life and natural healing looks at the person as a whole and aims to maintain or restore good health. It is with good reason that Oberstdorf, as one of few healing resorts in Germany, has twice been awarded the top title of “Heilklimatischer Kurort und Kneippkurort” (Climatic health resort and Kneipp health resort). As such, Tourismus Oberstdorf offers you a very special service to enable you to optimally plan your holiday and health requirements. A Euro-key can be borrowed or purchased from the café in the Oberstdorf Haus or the Oberstdorf Tourist Information Offices for a €25 fee or deposit. trail network are fully accessible for wheelchair users. The bike trail into the Trettachtal Valley, the circular trail to Rubi, the hiking trail via Kühberg into the Oytal Valley and past the ski flying hill to Birgsau as well as the highaltitude panorama trail on the Nebelhorn are even certified to the “Reisen für alle” (“Travel for all”) standard. The map can be purchased from the Oberstdorf Tourist Information Offices for €5. Disabled-friendly advice from Tourismus Oberstdorf The Tourist Information Office in the Oberstdorf Haus now not only has a portable loop system but also a fully accessible advice counter. The portable loop system, which principally improves the advice services for people with a hearing aid, is positioned between the visitor and the adviser. The system picks up the sound of people’s voices using a built-in or external microphone and transmits appropriate inductive signals to the integrated ring loop. These signals are received by hearing aids (set the latter to position “T” or “MT”). This minimises ambient noise and improves the quality of the advisory services. Anyone wanting to use this system can find a help desk equipped with it at the back of the Tourist Information Office in the Oberstdorf Haus as well as in the Tourist Information Office at the railway station. The respective counters are labelled with a clear pictogram. Visitors who use a wheelchair can now be served at eye level by Tourist Information Office employees at the disabled-friendly counter in the Oberstdorf Haus. This counter is freely accessible for wheelchairs and makes it easier to provide advice. It is also labelled with a clear pictogram.  list of providers of disabled equipment and wheelA chair emergency services can be found on page 84.
i All recommended excursions and leisure activities that are suitable for wheelchair users and certified to the “Reisen für alle” (“Travel for all”) standard are identified by this icon in this hiking brochure. 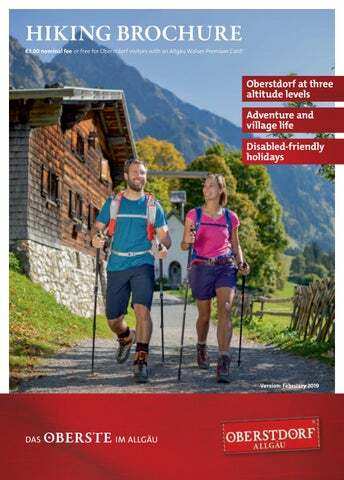 Whether youâ&#x20AC;&#x2122;re looking for contact details or practical advice, helpful information for planning your holiday or tips on what to do while here, this section offers plenty of great information for your holiday in Oberstdorf â&#x20AC;&#x201C; all presented in a compact format and quick and easy to find. Getting here by car Take the A7 Flensburg-Füssen motorway to exit 136 Dreieck Allgäu (Allgäu Interchange), then continue on the A980 motorway to the Waltenhofen exit. From there, take the B19 to Oberstdorf. *Only valid when staying overnight in tourist accommodation in Oberstdorf and its districts. B12 from Lindau / Isny to the Waltenhofen exit. From there, follow the B19 to Oberstdorf. Getting here by bus Door to door service. The professionals from the “Komm mit” bus service collect you from your home and take you reliably, safely and comfortably to your holiday accommodation in the Allgäu – and all for a very affordable price. F or contact details, see page 85. The benefits of staying in Oberstdorf Benefits of the Allgäu Walser Premium Card When staying in Oberstdorf, you will receive an Allgäu Walser Premium Card on your arrival. This is an Oberstdorf visitor card provided by your host, which entitles you to receive an array of free and discounted services. A  ll information about the benefits of the Allgäu Walser Premium Card and how to use it can be found in the “MehrWERT” (“Added value”) leaflet obtainable from your host, in any Oberstdorf Tourist Information Office or online at www.oberstdorf.de / tourist-info. Children under the age of 15 go free when accompanied by a parent. i Booking your package offers You can book the package offers you wish to avail of on your Allgäu Walser Premium Card quickly and easily in the Tourist Information Offices in Oberstdorf (Oberstdorf Haus, Bahnhofplatz), in Tiefenbach and Schöllang or directly with participating host businesses. The main projects will be completed in 2019 so that the facilities can be tested during the winter of 2019 / 2020 in preparation for the FIS Nordic Ski World Championships 2021. All building projects are scheduled for completion in 2020. Visit www.oberstdorf2021.de for more information about these building projects, including a detailed daily construction journal. Until the long project phase is completed, our visitors can avail of the facilities at alternative health resorts at reduced prices. Holders of the Allgäu Walser Premium Card will receive a discount of €2.50 per person per visit at the nearby “Wonnemar” and “Aquaria” waterparks. Visit www.neue-therme-oberstdorf.de for regular project status updates, e.g. in relation to the architectural competition. Some exciting results are expected by the end of summer 2019! Disabled equipment GesundheitsEck Wheelchair hire and emergency services Ludwigstraße 2 87561 Oberstdorf Tel. 0 83 22 / 940 80 32 www.gesundheitseck.de * This list contains providers who agreed to have their contact details published in Tourismus Oberstdorf print media. Subject to change. Mountain rescue / safety Oberstdorf standby mountain rescue Birgsauer Straße 35 87561 Oberstdorf Tel. : +49 (0) 83 22 / 22 55 www.bergwacht-bayern.de (Office during business hours – this is not an emergency number; the mountain rescue team for anywhere in the Alps can only be alerted by calling 112).